When I was 16 years old, my parents got together and purchased an electric bass for me as my combined Christmas/Birthday present (my birthday is two weeks before Christmas). It was a big deal; we weren’t “made of money” by any stretch, so it meant a lot to me – and changed my life, musically. My dad is also a bassist, so he was able to “vet” the purchase with knowledge of getting a “good” bass for the money. It was an Epiphone (by Gibson) Rock Bass, a four-banger with J-bass pickups and a slim neck. While a relatively humble instrument, Dad picked out a really good one with excellent resonance, clean electronics, and he set it up to play well. 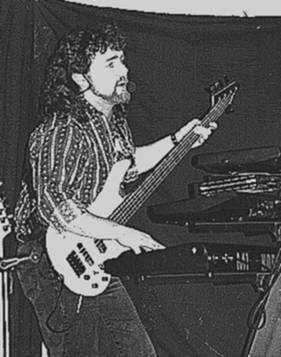 I played that bass for many years, onstage and in rehearsal, with several different bands. Some songs I wrote during the period only felt “right” on that bass. I later upgraded it with a set of EMG pickups and it sounded amazing. When I felt like making the jump to a five string, I found a fiver made by an (at the time) unknown brand called “Samick” at a local music store for $350. It was nifty, with a modern body style, J/P config active pickups, a pearlescent white paint job, and cool Saturn inlays on the fretboard. Again, played the hell out of that bass, and also upgraded to EMGs, this time with 18v electronics and their BTC circuit. Sounded, played killer. Now that I’m older and have a bit more spendable cash, I really wish I had both of those basses back. I almost have contact with the old co-worker (I’m friends with his friend and have emailed his spouse on Facebook, but not gotten directly in touch with him) and I’ve tried to locate the email address of the guy who bought the Samick (but lost the original email trail in a computer crash several years ago). Recently, the band where both basses got lots of play re-formed for an anniversary concert (see my last blog entry for details). The show was a great time for both us and the audience; I’ll post links to the YouTube clips soon. I really would have loved to have both of those basses for the show, but I had neither. So I recreated them; I got a black Epiphone just like my old one (but not quite as good) and found a Samick that was pretty close; I played the Samick for the show. It had the feel and sound of the old white one, but I still wish I had the old one back. I went through all that to say this: gear has to be sold to make way for new gear. But if at all possible, try to hang on to your substantial “firsts,” even if they’re cheap Epiphones, Samicks, or otherwise inexpensively obtained instruments. I can say from experience that you’ll probably regret it.